If Debbie Harry sang there that would be enough to turn it into a shrine in my book. Maybe the failing world economy will force us to rethink the $250.00 shirt. Not that I've ever spent more than $20.00 for a shirt in my whole life. Thanks Ken, I'm sure you feel better after your rants, I know I feel better after your rants. And, sorry but I still don't know what Bloomberg has to do with all this. He's the mayor, not the owner of that building, or a realty promoter, or the savior of every business of the city. Ken...I am enjoying your tour of the City and learn a lot as I read each post. I take it back: I don't think green tea will help. I would go straight to herbal tea in your condition - you know, something soothing. Ken, your opinions show a healthy concern for the world around you. Rant on. I don't know about herbal tea but I've heard it can lead to the hard stuff, like crystals, tarot cards and high colonics. It could be a downward spiral. Stick to green tea is my opinion, which is considered less than useless in most circles. Jeez. I thought LA had cornered the market on this kind of thing. Sigh. Thanks for bumming us all out, Ken... I can see it now: Tinpan alley transformed into... A DKNY WAREHOUSE STORE!!! Yesterday I received - by surprise - the "Blogging Friends Forever" Award for my photography. According to the rules I can now myself give this award to 5 other bloggers of my choice. I have chosen your blog as I like your narrative approach. Please visit my blog and you will see your name among the 5 in question. Then it will be your turn to give the award yourself to 5 other bloggers of your choice, according to the rules you will find indicated there! Well, one thing, I do like the new CBGB logo without all that tagging. I detest tagging and graffiti as much as I detest the designer chain shops and restaurants. Wow, and here I thought this sort of affluent "wannabe hip remembering the old days" were only stationed in the suburbs. On the downside to a cleaned up look,the premmisis will be inundated with suburban princesses reliving what they only have heard stories about. I feel for you. Well said. I've seen this happening in th cities in the UK. Too common a disease. Ken, Thanks for the recent comments on my blog! I live on Bleecker in the West Village and what has happened to the blocks between Christopher and Bleecker's terminus at Hudson/8th Ave. is disgusting. How many Ralph Lauren's and Marc Jacob's do we really need? I hardly know my own neighborhood now. As a small business owner i live through the bs that Mayors Rudy (the real culprit in transformong NYC into what it's become today)/Moneybags have done to this once great city. You can't fight the greed of landlords when companies like Starbucks/McDonald's/CVS/etc are paying 2/3 times the going rate for rents. 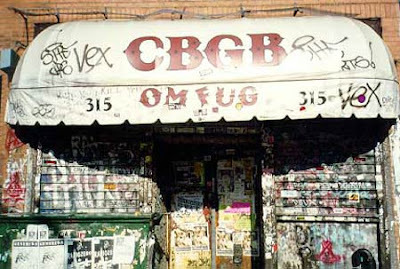 btw the Velvet Undergtound never played CBGB's. interesting article. I would love to follow you on twitter. By the way, did any one learn that some chinese hacker had busted twitter yesterday again.